For the architects of Japan, 2011 became an unforgettable year. On March 11, the Eastern Japan Great Earthquake struck, and six month later on September 26, UIA 24th World Congress of Architecture opened. I witnessed transformation of the world for Japanese architects, suddenly expanding beyond the pages of architectural magazines during the course of a year. There exist an organization “The Architects Regional Council Asia”, commonly called “ARCASIA”. ARCASIA, established in 1970, is a regional organization consisting of eighteen national professional institutes in the Asia Region. The motivation of the founders was to express the independence of architect practicing in the newly formed Asian nations, formally part of the British Empire. 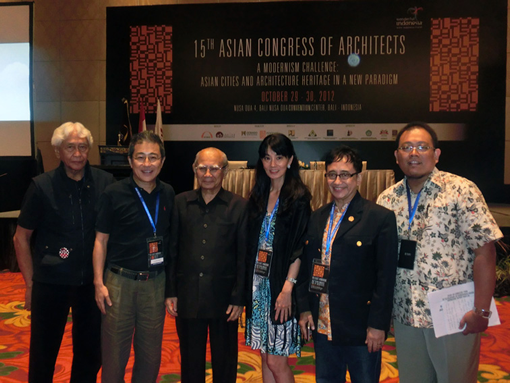 Several Asian delegates to the Commonwealth Association of Architects (CAA) came together to draft a declaration and the constitution for the founding of ARCASIA. 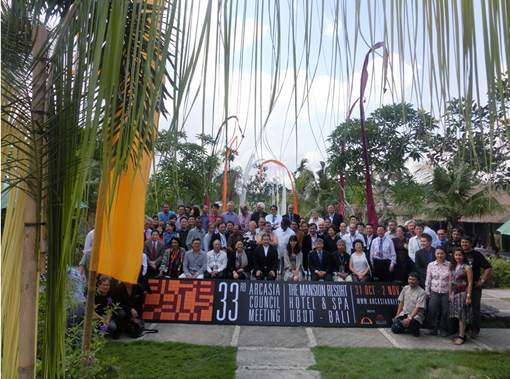 ARCASIA began with ten original member institutes, mainly from South and Southeast Asia. In the 1980’s membership grew and by the 90’s, China, Korea and Japan joined the membership to expand ARCASIA into Asia-wide organization. In 2006, ARCASIA signed a Memorandum of Understanding (MOU) with the International Union of Architects (UIA). It elevated ARCASIA to the status of a regional organization recognized by all member sections of the UIA. In the past two years, ARCASIA strengthened its network by signing MOUs with the Architect Council of Europe (ACE), the African Union of Architect (AUA) and the International Association of Unions of Eurasian Architects (MASA). Through this network of international organizations, architects in Asia are connected with the global professional community through their membership in the member sections. Architecture belongs to a vital group of professions which contributes in the progress of national development. In their scope of professional expertise, architects plan, design and supervise the execution of their design in the construction phase, to guarantee the public safety and to realize progress and sustain heritage. Thus, an architect is a creator/technical expert of both technology and art contributing to society in a variety of ways. In Twenty-first Century, Asia has become a hotspot of global economy, providing major market and manufacturing environment to international businesses. Recognizing that international businesses are coming into the region in large numbers, ARCASIA is promoting, to the national governments, establishment of the profession under the architect’s registration law. At the moment, there, still, are differences among nations in the stages of this process. There are nations in Asia, still without the national recognition of the architectural profession, resulting in the unclear positioning of the design/supervision of architectural plans in the development/construction industry. In such cases, we come across evidence of political pressure from profit-motivated stakeholders who do not benefit from the establishment of architectural profession under national law. On the other hand, while promoting progress of architectural technology and sustaining architectural heritage, ARCASIA architects provide quality professional services throughout Asia. In a global society, information sharing becomes vital in mitigating interruption in the process of dissemination of information. ARCASIA, as a regional organization, contributes to fair and efficient exchange of knowledge/information through internal organization and public programs, promoting the principle of the “architectural profession trusted by the society”. Primary vehicle for ARCASIA in disseminating message to the Asia region is though annual regional events: Asian Congress of Architects (ACA), the major architectural conference of in Asia and ARCASIA Forum, a smaller conference held in the year between ACA conferences. In these conferences, architects come from all parts of Asia to discuss the latest technology and topics under specific theme. Keynote speakers of international prominence, selected papers, architectural exhibitions and visits to architectural sites are ways in which to voice concerns of ARCASIA architects and the society in Asia region. Asian Congress and the Forum attempts to express the relevance of our profession to the Asian societies. Selective process of the academic papers also contributes to the discovery of new leaders and scholars of the profession. Recent themes of the ARCASIA events include “Changing Asian Cities and Architecture” (2006), “Region and Beyond: Communicating beyond Architectural Profession” (2008), “New Order for Sustainability” (2010). In these Congresses, many topics concerned with the Asian cities of the twenty-first century are discussed including ecology, cultural heritage, city and politics, emerging field of research. Honorable Dr. Mari Elka Pangestu, the Minister of Tourism and Creative Economy, opened the Congress with her keynote address recognizing the vital role of architects in creating sustainable environment and to elevate the level of cultural maturity of a developing society. It was a refreshing message for architects, as a government official recognized the benefit of our profession and encourage the society to support our profession. In another keynote speech, Pritzker Prize Laureate architect Fumihiko Maki delivered his message of modernism in the contemporary Asian society. Maki described his architectural works relative to the traditional Japanese culture and spaces, to show that modernism can be contextual in Asian environment. As the President of ARCASIA 2011-2012, I made an opening remark relating to the importance of architectural profession gaining recognition in all societies. Becoming integral part of a society and its economic, political and social systems, architect’s mission will become highly relevant. Result is that architect’s proposals, such as solutions to human habitat, environmental problems and class society, will be recognized as expert’s voice, based on their professional knowledge. Furthermore, I made an appeal to the audience to go beyond Asia region, to network with other regions to cooperate and tackle contemporary challenges of our profession. In the planery session, Architect Tey Kheng Soong, made a critical assessment of the capitalistic society and promoted sustainable architecture from humanistic viewpoint. In one of the afternoon breakout sessions, I sat in a session with an interesting and enlightening presentation by the lighting designer xxxxx, on the important and delight of “darkness” in nature and in the contemporary environment. Dr. 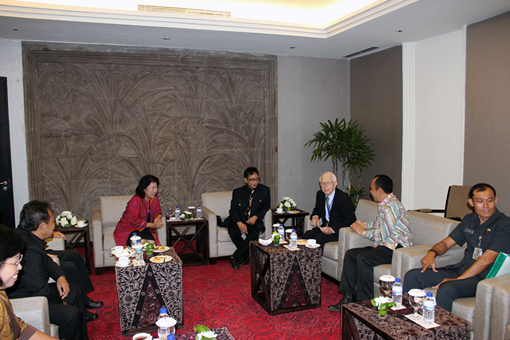 Professor Emil Salim and the ARCASIA organizers. Dr. Salim has served as the Minister of Communication, Manpower, Development and other important posts during his more than 45 years of government service. 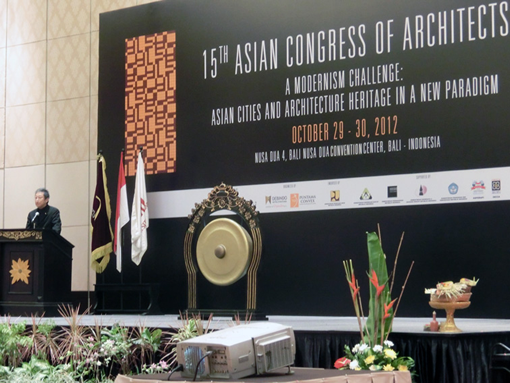 ARCASIA Award, the highest honor given to the architects for their built works biennially, is given at the prestigious award ceremony during the Asian Congress of Architects. Every two years, projects are nominated by the member institutes for the twelve award categories from single-family homes to industrial architecture. In this year’s ARCASIA Awards, out of twelve categories, seven Gold Medals were given to Japanese architects. Seven winners were: Ar. Keisuke MAEDA for gravity-free expression of “Atelier Bisque Doll”, Ar. Koh KITAYAMA for healthy arrangement of natural light in “G-Flat”, Ar. Ben NAKAMURA for eco-conscious design of “Nanasawa Kibou No Oka Elementary School”, Ar. Yumi KOHRI for adaptive reuse of folk house in “Atelier Shieto”, Ar. Masahiro KINOSHITA for innovative organization of functionality and rationalistic expression in “JFE Chemical”, Ar. Kazuo MATSUO for contemporary interpretation of Noah’s Ark in “Kohitsuji no mure Church of Wind”, Ar. Hiroshi NISHIMURA for the center-piece of community design in “Iwamizawa Station”. I believe that main reason for the strength of Japanese architects in the ARCASIA Awards is the evidence that the level of the profession in Japan is extremely high. It goes for, both, the technology and artistic sensitivity. In addition, their works, often, express rigor of architecture integrating architectural space with structure and expression of intention in the architectural details. Their works communicate unique make-up of contemporary Japanese culture and society. I believe that there will be global demands for such balance and the rigor of Japanese architecture and their architects. Thus, Japan can export their services abroad, if they so desire. 2012 was second and final year of my ARCASIA Presidency. It was the year to show results of what we set out to accomplish in January 2011. Although the Japan Institute of Architects (JIA) joined ARCASIA in 1991, ARCASIA is not a common household word for most architects in Japan. As a Japanese- American based in New York, I foresaw the sublime of Asia in the Twenty-first Century and decided to close my office in Manhattan to head west across the Pacific Ocean to Asia in 1997. When I arrived in Tokyo, I saw that Japanese architects showed almost no interest in Asian architecture. They were still looking towards Europe and the United States. I joined the JIA and volunteered to the International Committee and to become a member of the delegation to the ARCASIA. In my practice and as a full-time academic, my research and projects focuses on the Asian architecture and cities. For the UIA Tokyo Congress, many Asian colleagues and friends came to Tokyo to participate in the Congress. I believe that my personal network made small contribution with my long-time association with the Asia region. Today, I am living in Beijing having been appointed a visiting professor at Tsinghua University and feeling the hot breeze of Asia. Japan is located far at the eastern edge of the region, isolated from the rest of Asia region. It is vital for the Japanese architects to learn to be more global to go beyond the borders to market their services, which will have demands, if approached strategically. I have also seen the evident that the Japanese architects certainly discovered the connection to the international community at the UIA Tokyo Congress and now are ready to go abroad. We are in the era of the cross-border practice. It will be thirteen years since I joined the ARCSIA network. During this time, I was fortunate to meeting large number of architects, colleagues and friends in ARCASIA. The Asian architects are interested in the high quality of architects and the profession in Japan. Japanese architects are now discovering the activities of architects around Asia and the fascinating context in which they practice. Timing is right for the Japanese architects to join the rest of Asian architects in a great network of ARCASIA and begin exploring the possibility of regional cross-border practice for mutual benefit. From Isolation to Association… Go Asia and Discover Our Region!